I inspect the subject of politics with a certain amount of caution, most of the time, in this space. Partly this is because the header of this blog identifies me as a lot of things, but as a politician it does not. And, well, politics is a topic that is so full of potential land mines that I step carefully. Also, I do have perfectly wonderful friends and colleagues whose politics don’t line up with mine. Most times, we agree to disagree by talking about other things, like the latest Red Sox bullpen blowup, or the latest cool choir anthem, or something. Nonetheless, I feel fairly safe in addressing today’s topic, as I can force it into Not Being About Politics. Tell me, Mr. Gershwin, what causes that? I shall leave aside the faint possibility that Sen. Ted Cruz (R.-Tex.) made this statement in the effort to reassure a certain group of potential Republican presidential primary voters that he speaketh their language. Which is to say, an example of shameless pandering. Because this is Not About Politics. I am tempted to examine briefly the idea of the crisis conversion. There is much documentation in the professional psychology community about what emotional and psychological conditions may contribute to someone’s ability to suddenly adopt one set of views or values over another, in the wake of a sudden event. Much of the published research dealing with this topic similarly emphasizes the greater effects of emotion over those of reason, in these moments of conversion. Not that there’s anything inherently wrong with emotion; and as long as we’re not talking about making decisions about activating a nuclear arsenal, it may be safe to suggest that emotion is not necessarily the worst motivation for changing one’s mind about something. But, if we adopt that generic example as the model for this examination of the Sudden Conversion, well, consider all the footage you may ever have seen of American pop-music fans reacting to the arrival in the US of the Beatles, fifty or so years ago. What do all those, um, faintly emotional fans have in common? They were appreciating many things about the Beatles; probably not all of them to do with musicology … or guitar-playing technique … or the fact that John and Paul had no business being as truly great musical composers as they were, considering Paul didn’t (and still doesn’t) read music much, and they were neither of them far removed from their own teenage years. The fans were appreciating the cut of their suits, and the cut of their hair, and about a zillion other things that didn’t have much to do with music. But also, on some very gut level that had nothing to do with what in the world is that opening “Hard Day’s Night” chord made up of?, the Beatles’ music or performances or public images spoke to them. And so, we return to Sen. Ted Cruz, and the extent to which American country music – specifically, how its purveyors reacted musically to the 9/11 attacks (compared, reportedly, to the ways in which rock musicians did) – spoke to him. Again presuming that this is About Music, and not instead About Anything Else. I admit that I had to do a little research about this, since the only two specific things I had remembered about the aftermath of the attacks, musically, are Lee Greenwood’s (in my humble opinion otherwise execrable) song “God Bless the USA”, and the fact that more major- and minor-league baseball spectators have been made to sing Irving Berlin’s “God Bless America” during the seventh-inning stretch, than are made to sing “Take Me Out to the Ballgame”, since then. As I did this research, I noted a curious thing: the various lists of original songs written about the September 11 attacks, released in 2001 (presumably within the three months afterward), seemed about evenly divided between country artists and rock artists. The Charlie Daniels Band, with “This Ain’t No Rag, It’s a Flag”. Paul McCartney, with “Freedom”, from his “Driving Rain” album. The country band Lonestar, with “I’m Already There”, from their similarly-titled album. Neil Young, with “Let’s Roll”, from his “Are You Passionate?” album. Tori Amos, with “I Can’t See New York”, from her “Scarlet’s Walk” album. Toby Keith, with the delicately-drawn “Courtesy of the Red, White and Blue (The Angry American)”, from his “Unleashed” album. What did all these songs (and more besides) have in common? Seemingly, they all express sympathy for the victims, and outrage at the atrocity … and, as music very often does, they strive to comfort the afflicted. There are hardly any examples that I can find of music that begins to, conversely, afflict the comfortable, until well into 2003, let’s just say eighteen months later. My purpose here is not to wonder why that could be; to wonder what would bring on a gradual turn away from dogged patriotism, or at least care for the victims and their losses. Yes, the rapper Paris released a song called “What Would You Do?” which dealt with 9/11 conspiracy theories. And a Japanese singer called Misia, in collaboration with American singer Erykah Badu, released an anti-war song called “Akai Inochi (Red Destiny)”, which spoke of how the events of 9/11 turned the “seemingly distant existence of war into the reality of now”. Ah ha! These songs didn’t come directly after the attacks, but they came! And they were done by people other than country artists! …Is what some supporters of Sen. Cruz may be saying, if they’re doing similar research to mine. Okay; but then, there was that controversy surrounding that pesky group of uppity women called the Dixie Chicks, and how they (as members of the country music community that Sen. Cruz admires, with such a broad brush, as being “his people”) kinda stirred up the waters a bit, bein’ all critical and anti-war ‘n’ stuff. Harder to jam that round peg in that square hole, I think. Now, I am loathe to assume I can read people’s minds and know what they’re thinking and feeling all the time. I would be arrogant to suggest that I know, know for a fact that Sen. Cruz is full of it when he suggests that directly after 9/11, he perceived differences in how country and rock musicians were responding to the attacks that were sufficient to generate in him a Sudden Conversion – an adjustment in his musical tastes immediate and passionate enough to rival a 13-year-old’s sudden obsession with the Backstreet Boys or the Jackson Five or the Beatles. I might be treading Hypocrite Territory, in that case. After all, recently (well into my fifth decade on Earth) I figured out that all those silly Marvel Studios superhero movies were pretty cool stuff. When it’s Tuesday afternoon, I get a little jazzed thinking, “hey, it’s an ‘Agents of S.H.I.E.L.D.’ night!” And at some point I will probably blog cheerfully about how great that little eight-episode “Agent Carter” show was. But it took me stumbling onto a cable-TV rerun of the “Iron Man” movie, followed by a similarly-located rerun of “Marvel’s The Avengers”, followed by a little research into the comic-book heritage of the Avengers’ roster – “now what’s all this about Thor, and Black Widow, and Captain-America-who-I-always-thought-was-fairly-lame? – although, yes, I perfectly well know all about the Incredible Hulk” – to get me to be a fan of the Marvel Cinematic Universe. Because I’m not 13 anymore. And neither is Sen. Cruz. And you don’t get as far into representative government as he has by doing things, making adjustments to your core beliefs, that would get you labeled as a Flip-Flopper. Stand firm in your beliefs! But let’s only talk about it in terms of music and psychology, please. Because it is, of course, Not About Politics. A fun thing about being part of the SUMC music team is the chance not merely to offer up music for the glory of God and the comfort of God’s congregration (via music publishing companies’ idea of Great Music) … but also to create music of our own: things that have Never Been Heard Elsewhere!! Music Director Kevin Murphy has composed music for a lot longer than I have. By comparison I’m a rookie. I’m much more likely to take a hymn and arrange it for the singers and instrumentalists at hand. But lately, I’ve found it fun to try to create something musical that doesn’t remind me strongly of something else I’ve heard recently. The Christmas cantata a year ago was almost “biting off more than I could chew”, but it just got me more interested in the endeavor. To that end, Kevin found a pair of poems by the Welsh poet, orator and Anglican priest George Herbert (1593-1633), which he thought might be worth trying to set to music. The one that got my attention was one called “Easter Wings”, and its “gimmick”, if you will, was its shape – a pair of wings! 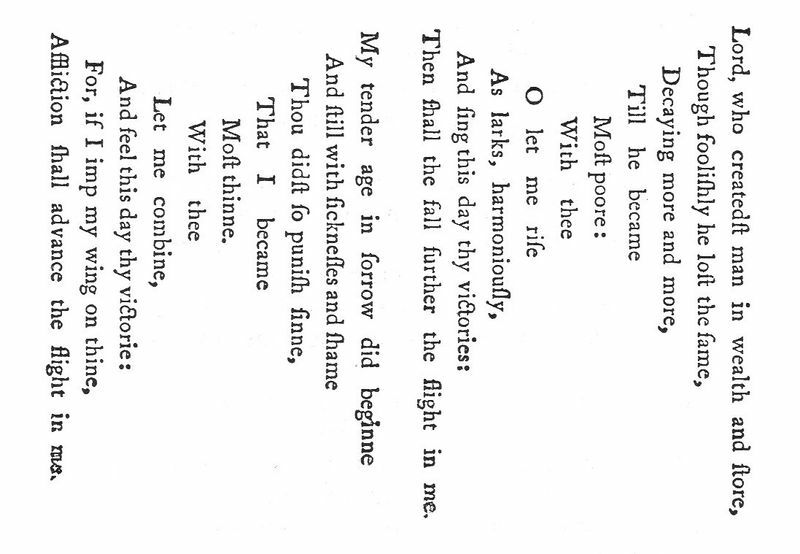 The number of syllables in the first through tenth lines of each stanza were: 10, 8, 6, 4, 2, 2, 4, 6, 8 and 10. The lines were centered, and voila! Wing shapes. You won’t have to use your imagination: the poem will be printed in Easter Sunday’s bulletin insert so you can follow along. How to set this to music? I finally settled on two ideas: first, most of the melody lines that the choir will sing use pitches that ascend step by step – a tiny bit of “text painting” to suggest flight (and it’s always better when creatures who wish to fly move in an upward direction, yes?). And second: with luck, listeners will feel like the organ and wind-instrument accompaniment for this piece is musically evocative of the activity of flight. What in the world is THAT going to sound like? We’ll find out this Sunday! Hm. I’m about to take that quote slightly out of its original special education context (I think it’s fair game, since the commenter didn’t specifically indicate that she was dealing with special-ed students either) and apply it to the larger world. Because as much as the actual article dealt with specific special-ed programs and such … the comment strikes me as emblematic of a larger issue. I might be addressing lots of folks here, from home-school advocates to teacher-bashers to budget-setters and beyond. Not to get petty, but do you know what that “piece of paper” connotes? Competence. And an investment in learning the skills and strategies and philosophies of education. Teaching, when it’s done well – which is a hell of a lot more than these education reform jockeys would like you to believe, and often under more daunting conditions than these for-profit charter school pushers will ever, ever see in their whole teaching (or, more likely, administrative) lives – is more than a gig. It can be a vocation … a calling. The middle sentence of that last paragraph was a ferocious run-on sentence. I can hear my English teachers gettin’ after me for that one. Hard to follow. Takes extra work to dissect. Readers will bail out. Know how I know? Because my teachers taught me that. That “piece of paper” also connotes the ability to educate more than one student at a time. Because there are more students out there in the world than just yours, and they all have the right to a complete education. And there may actually be things in the world that are worth knowing that they may never learn about, either through presenters’ ignorance or willful omission. Please note the recent dogged interest, in some parts, in cleansing the AP US History curriculum of any mention of when this great nation of ours screwed up. Must emphasize blind patriotism over, say, taking lessons from our imperfect history. Irony alert: if you can put out a press release about those evil teachers that contains proper spelling and grammar and sentence structure … thank a teacher.